With all the talk of the Occupier tank, I rewatched the ambush scene of Rogue one, and now I'm trying to duplicate some of it's deserty urban combat feel in Legion. These are my current buildings. 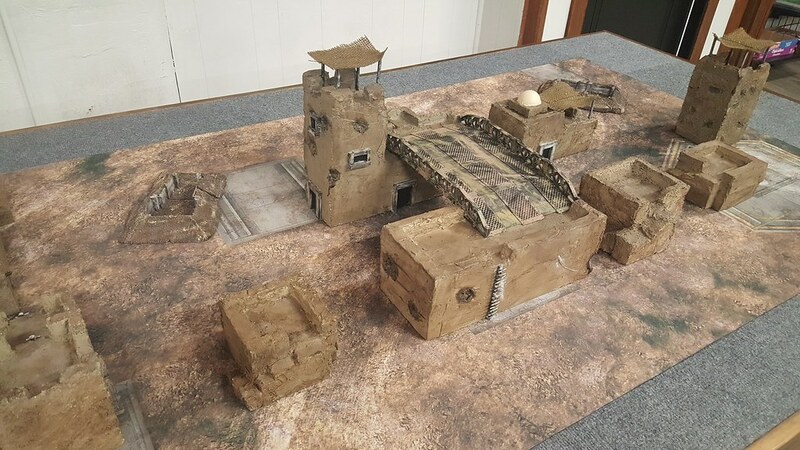 At the very least, I'd like to double what I have here, and add an additional overpass/walkway for more sniper positions and vehicle obstructions. Stay tuned. 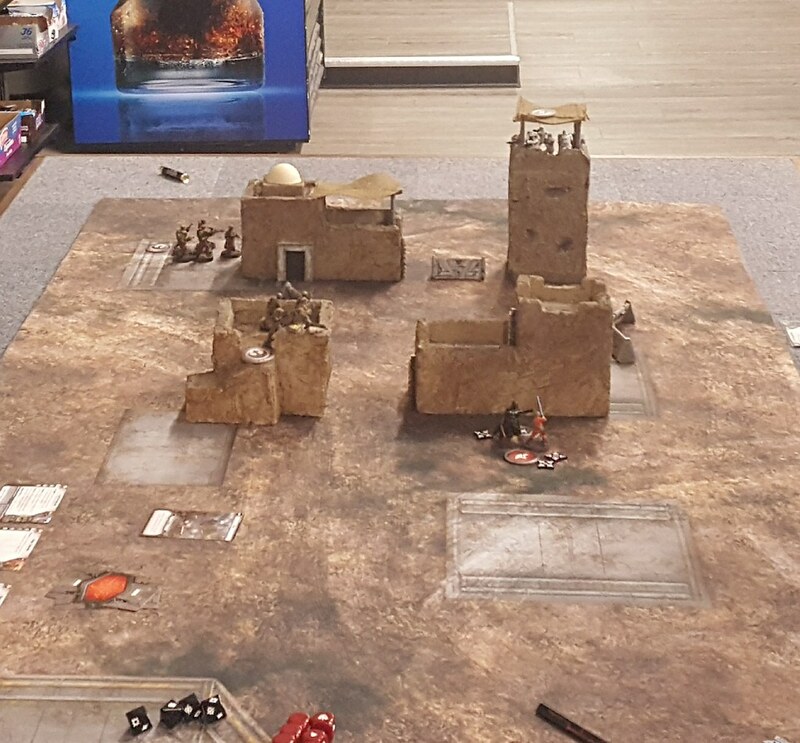 Hoping to have a full table worth of terrain by a Feb 16 tournament my local game store is hosting. I've thought about that, and I've see a few vendors that have posters I like. Once I get the town built up, I probably will try to add details like that. 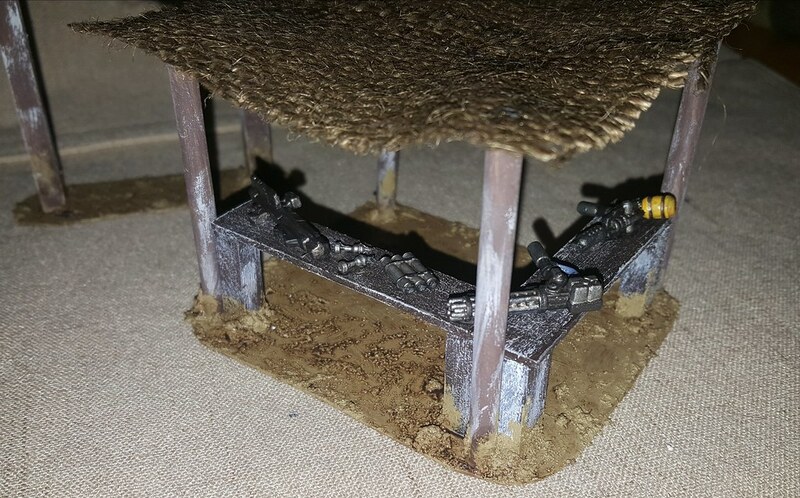 add some simple market stalls have it so vehicles moving onto/into them removes them from the board but they count as light cover for troops. helps you fill in some area. ... mmm I think I might make some myself now. Great idea. Shouldn't be too hard, and will be a welcome escape from dealing with styrofoam. Finished up the center piece of my little hamlet, and I'm pleased with how it turned out. Certainly became the focal point of a game when playing "Key Positions." 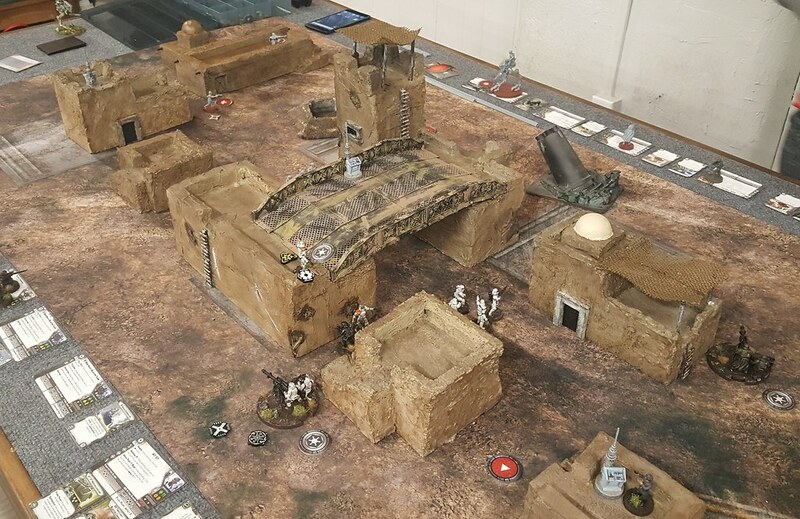 The overpass is just over 4" over the table, so it is tall enough to allow for AT-RTs and (hopefully) Occupier tanks, but blocks the movement of the AT-ST.
Not sure you'd need to buy posters. Just find some images you like, print them out on regular paper or card stock, cut them, and use Matte Mod Podge or something to stick 'em to your buildings. Possibly, though it depends on the size. 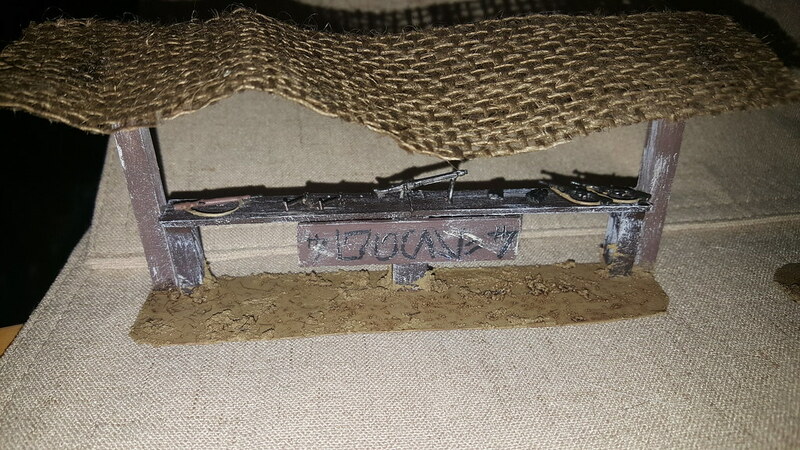 I've not had much luck printing items that small and getting any real detail out of it. If you have photoshop or something similar just make sure you crank up the pixels per inch value and they should come out fine. Probably won't add much to the cover and terrain of the town, but hopefully these will add a bit to the "feel" of the place. 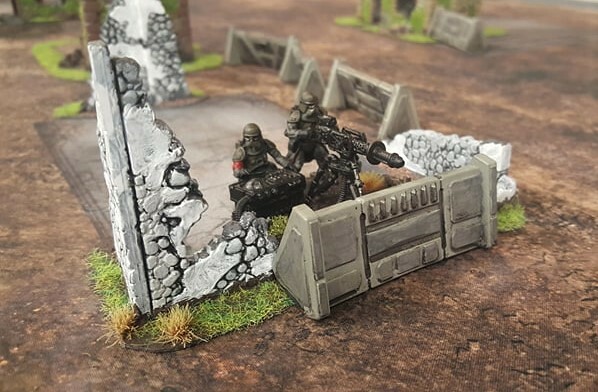 Actually, I’d say those are perfect for light cover terrain pieces which, honestly, I think you need to break up the “kill lanes” you create with an urban block setting. What did you make your buildings out of? 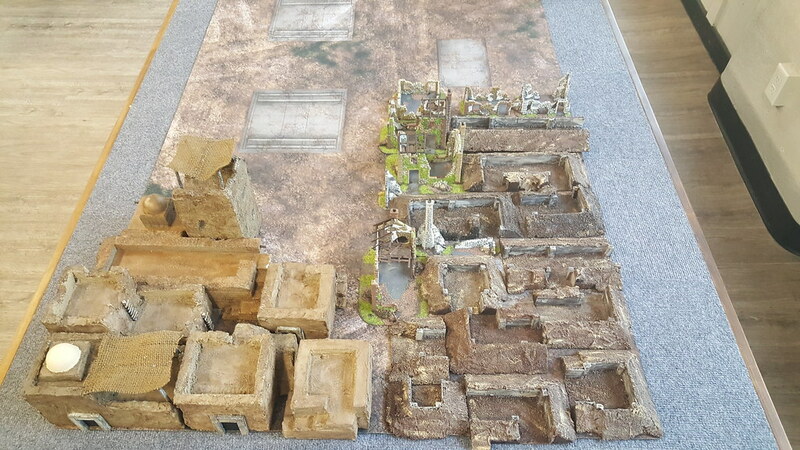 Craft styrofoam from Hobby Lobby, mostly, with a couple of buildings and second story low walls being made from the "plucked" foam I pulled out a "pluckable" foam storage case. In every case, I cut and glued it into the shape I wanted, then covered it in drywall spackle, primed, and painted it. It's actually pretty easy, all things considered. Nice that was going to be my plan as well. 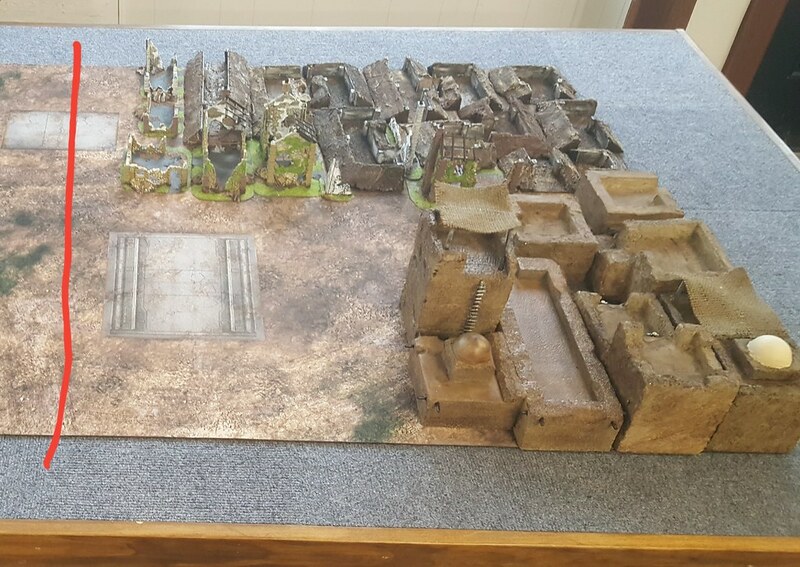 I'd like to make a few buildings instead of buying 3D printed ones. I think you get more bang for your buck out of making your own. 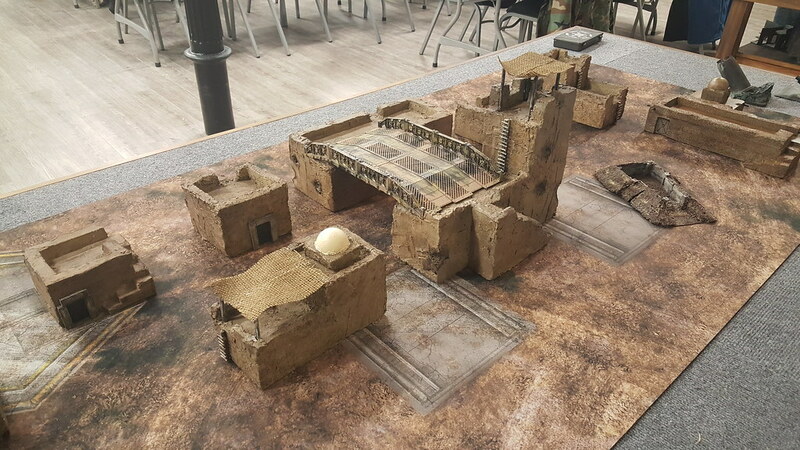 Some things are undoubtedly better 3D printed, but simple, square buildings are too easy not to make on your own. For round, hut-type buildings, I use the containers from Country Time Lemonade mixes. They make good looking Tatooine-ish buildings too. 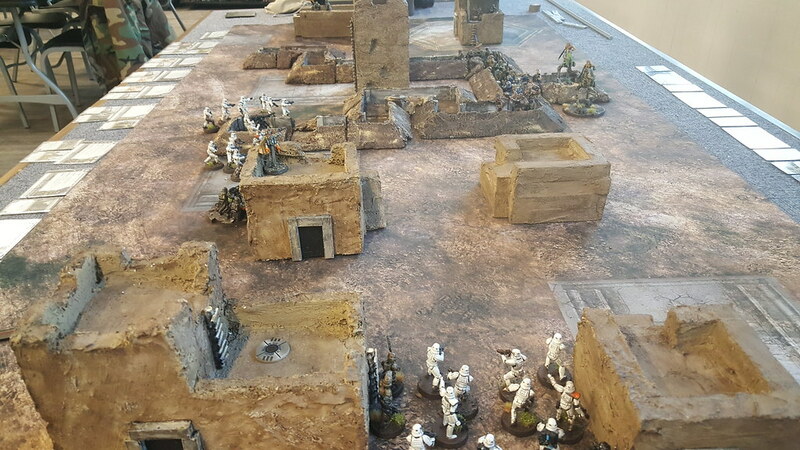 Played a (very long) game today, and much of the fighting was in the arms market. The cover 1 provided by the stalls rapidly went to cover 2 when suppression started being handed out. Made for a fun game. Awesome! So many great little details. Where'd you get the crew for the E-Web? Depends on which one you're talking about. 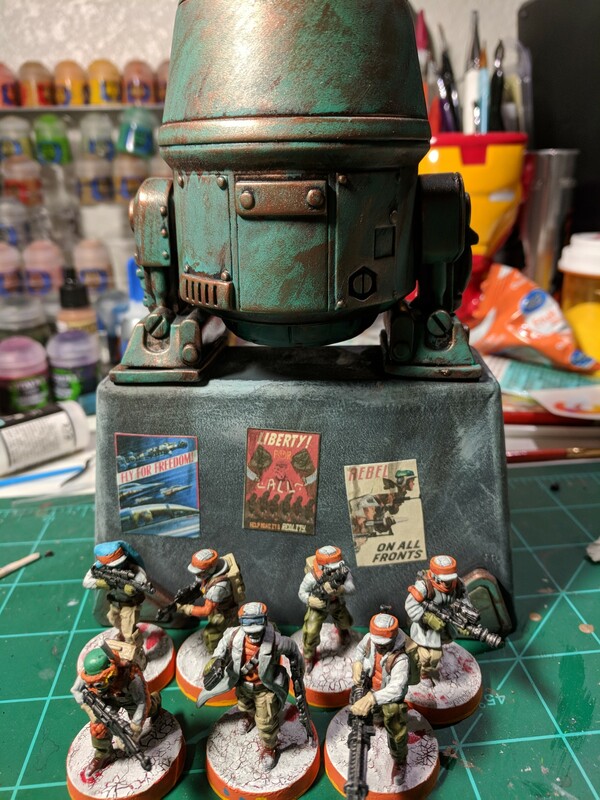 The one in the picture directly above is actually the regular Snowtrooper crew, painted in Mudtrooper colors. 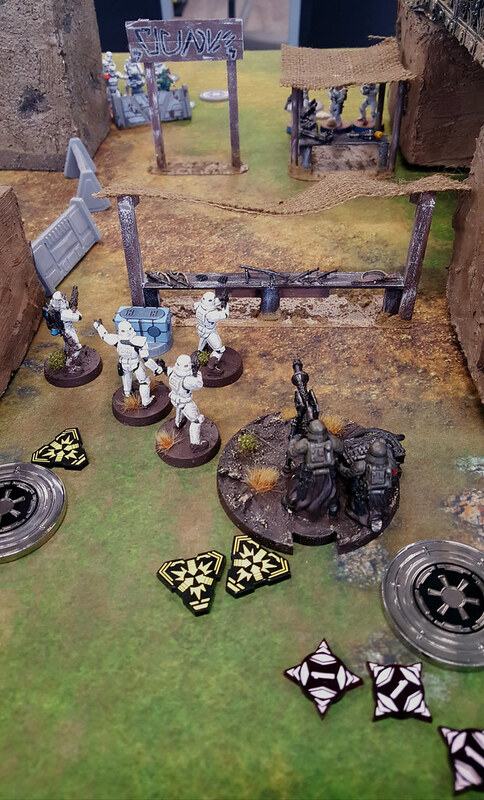 The other crew is a kit-bashed Stormtrooper unit. I've got a few pictures of them in my "Alpha's Army" thread in the painting section. The one in the picture directly above is actually the regular Snowtrooper crew, painted in Mudtrooper colors. That's the one I meant. Nice work!